I met with several midwives, but I had a difficult time choosing one. Then one night, I had a dream that one of them, Davi, was with me when I delivered my baby (but oddly, I was not at home!). I took that as a sign to choose Davi as my provider. I trusted Davi from the start, and by the end of my pregnancy had full confidence in her. At my consultation appointment with Davi, I shared my last birth story and told her the doctor essentially told me I could not birth a baby vaginally and I shouldn’t “bother with the trial of labor!” and that I didn’t have a chance! And as much as I wanted to try for a vaginal birth, after my first experience, I had my doubts that my pelvis was big enough (I’m 4’11”). Davi discussed my family history (my mother had 8 vaginal births), did an internal examination, said I had a great pelvis, and could birth a small pony, and she assured me that I was a great candidate for a natural home birth. I came back from my ultrasound a stressed out a mess. What would I do now? So close to the end of my pregnancy, my plans for a peaceful homebirth were falling apart. I turned to the internet (big mistake) and started reading about the risks of placenta growing on the scar, the odds of hysterectomy etc. At 12 am I found myself worrying 7% maternal mortality rate with placenta accreta and getting tearful about who would raise my son…I started from point A again, researching vbac friendly doctors who would give me the hospital birth I wanted… The next day, I hosted a prenatal pilates class in my apartment, and one of the women in the class mentioned that her OB, Dr. Paul, was amazing and she had a successful VBA2C with him (a few months later she birthed a breech VBA2C’s with him!). I started asking around, and everyone had only positive things to say about him (including Davi). So I booked a consultation appointment with him for early the next week…. On Friday, I went in for my follow up ultrasound, and lo and behold, the first ultrasound was a false alarm. The placenta was a good 9 cm from my cervix! But I went in for my consultation on Monday with Dr. Paul anyway. Like all doctors, he lectured me on the risks of an HBAC and strongly recommended I do a hospital birth and said if I chose to do my birth with him, he would allow me to do it mostly intervention free (the only intervention he would require is the continuous external monitoring). At my 39 week appointment with Dr. Paul, he wanted to do a cervical check. I refused without him first giving me a good reason. After some coaxing, he said that if I was dilated, he would like to do a membrane sweep. I absolutely refused. Not this week. And not until I was well overdue would I consent to a membrane sweep. He then asked when I would allow him to do an internal examination. I responded, when I’m in the hospital ready to push. He laughed it off, but told me that if I was not going to let him to anything, there was no reason for me to come in the next week, and I should make my next appointment for after thanksgiving (3 days after my EDD). Then updated her at 4:40 pm: Update: every 4-5 min for the last hour. ~30-45 seconds long. No blood. A bit after 6 pm, Davi came around to check on me. For the 20-30 minutes she was over, my labor slowed down a lot – my contractions became irregular for the first time in hours, and I hardly had any strong ones… Davi asked to check my cervix, but I was very resistant. Last time, my labor took a nasty turn after my first cervical check. Davi took this as a sign to sit down with my husband and I to discuss the fears I seemed to have lingering. My main fear was that my labor would be long and hard and would end up the same way my son’s did, with 3 hours of pushing and a head that wouldn’t pass my tail bone…I don’t remember what Davi said to me, or if it was just verbally releasing the fear, but after this discussion I felt a lot more confident…And I finally allowed her to check my cervix: 1 cm, and still long and hard. Davi told me I was still in VERY early labor and I should stop timing my contractions. She stressed, don’t pay any attention to them at all! She told me to take a bath, drink a glass of wine, and go to SLEEP. BUT, she stressed, I should call her whenever I felt like I wanted her to come back. With some difficulty, I got out of the bath and got semi dressed and got into bed. I was shivering/shaking and having a lot of trouble relaxing. The time in between when Davi left and when she came back to support me was the only portion of my labor that I would describe painful…. When my son got back from the library at about 7:30/8 pm (I lost track of time after Davi told me to stop timing my contractions), and he came to talk to me, I really couldn’t give him the attention he was looking for, and I really wanted some labor support. I asked my husband to keep Rafi busy and to please call Davi and ask her to come back. I was expecting to go through a transitional stage of feeling like I couldn’t do this anymore or I was going to split open…But this was completely manageable… I was completely shocked and thrilled that I was 9 cm already! Davi called the doctor (incidentally for the first time, since she was under the impression that I was in early labor all this time…), and we headed toward the hospital, normally a 10 minute drive. I only had 2 contractions on the drive there, so I’m guessing we got there a lot sooner than 10 minutes…. In the hospital parking lot, the benedryl hit me…I could barely keep my eyes open, and was leaning on Davi, practically sleep walking…I think she kept telling me to open my eyes when we were walking through the hospital halls….And either my contractions got more mild, or I was just too tired to notice, but it seemed like I was getting a bit of a break compared to the last couple hours. At the check in desk, the nurses wanted to send us to triage, but Davi kept insisting that I needed a room NOW, and that I was 9 cm…They asked for my insurance card and ID and I was lucid enough to direct Davi to the front pocket of my suitcase (but I doubt I could have gotten them out myself!). Finally, for some reason, they agreed to skip triage and set me up in a room. 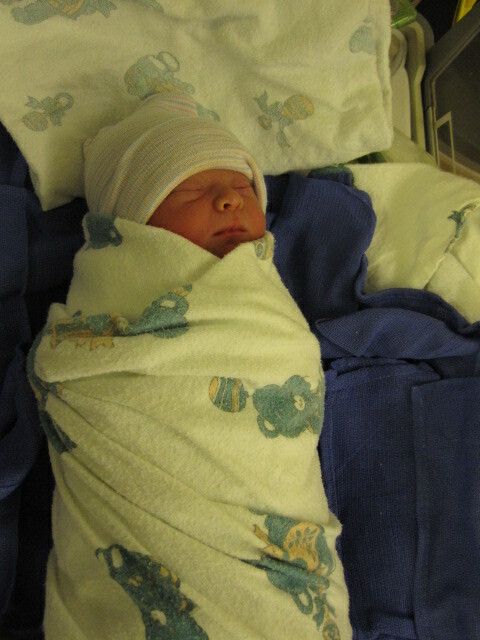 [My records indicated that I was admitted at 12:20 am]. They had me get up on the bed, and kept asking for my arm to take my blood and set up the heplock (the one intervention I had agreed to), but this whole process took a while, in between contractions, and I didn’t realize until after I had the baby that they popped my vein and never did manage to get that heplock on (I’m not sure they even drew blood – I think they ended up drawing it after I had the baby…). The next bit of my birth story is even more of a blur…And even though I asked both the doctor and Davi at postpartum appointments to fill me in, they both kind of brushed over exactly what happened…The baby started showing signs of distress…Heart rate was down in the 90’s (and not picking up in between contractions??). They asked me to switch out of my kneeling position and lay on my side instead, I resisted, since it was really important for me to birth in an upright position, both to prevent tearing and to avoid having the baby get stuck behind my tail bone like my last birth…But Davi looked me in the eye, and said, “your baby does not like your position, you need to do this!” I was given an oxygen mask, and Davi was looking me in the eye and telling me to focus…I remember someone saying the side position was better…At some point the doctor said something about needing to check me during the next contraction. I remember being amused that the doctor was finally getting a chance to do his vaginal exam! It took the baby a while to settle down, but everyone else in the room was all smiles and congratulating me right after giving birth. The doctor was particularly congratulatory and he noted that although he liked my determination to have a VBAC, he thought my odds of being successful were quite low based on how my previous birth went…Then and there, he also gave me “permission” to have my home birth next time! The doctor later told me that this was the fastest and easiest VBAC he’s seen and that I took everyone by surprise. 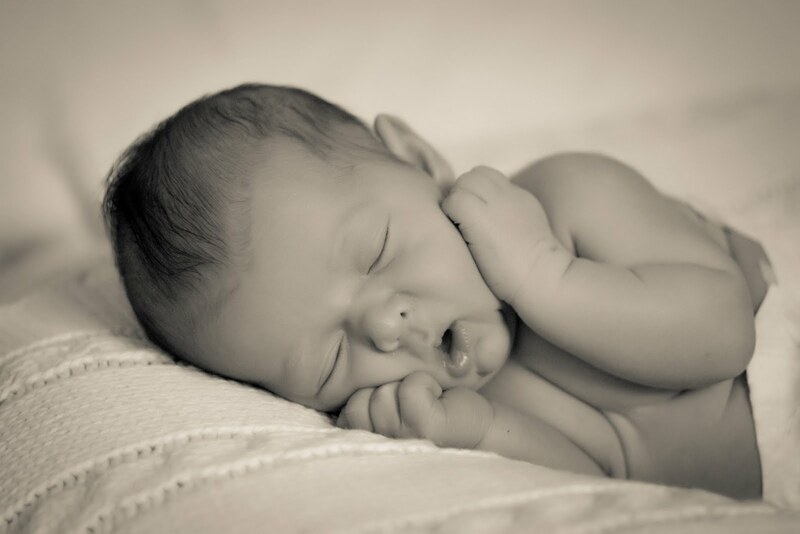 And should I be blessed with more children, I should have no trouble birthing even a larger baby…After relating what the doctor said to some of my friends and family, it turned out that a lot of people had doubts that I could birth my baby vaginally (including my husband! ), but thankfully, they all kept it to themselves, and I felt nothing but support for all of my VBAC efforts from my family and friends. Overall, I was thrilled with my birth experience, and would do it again tomorrow if I could! The only major disappointment I had was the 2nd degree episiotomy/tear (the doctor at some point said something about feeling bad that I tore more after he cut…). I still wonder whether it was a necessary intervention…I also wish I didn’t take that benadryl. But that aside, almost 4 months later, I still feel empowered when I think of the birth experience! I have to comment here that I could not have done this alone and I am very grateful to a lot of people. I am so thankful to my family and friends, to my midwife, chiropractors, doctors, to the birthwithoutfear facebook support group, etc. 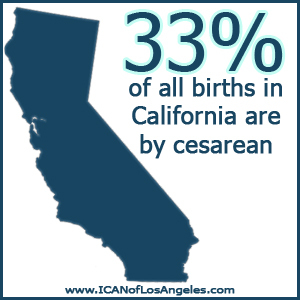 Additionally, I am so grateful to ICAN of West Los Angeles for being a fantastic resource and support during and before my pregnancy. I have to offer a special thanks to Chelsea Shure for offering advice and support throughout my pregnancy, and really for starting ICAN in Los Angeles at just the right time. Thank you! Thanks for sharing your amazing story, Goldie!! This entry was posted in Birth Stories, VBAC and tagged birth, VBAC. Bookmark the permalink. Goldie!!! Such a wonderful story! I think all of Davi’s clients can bond with you about the walking. I was so mad at her during my walk. She kept saying “What would you tell your client to do?” And I got pissed and said, “Stop being ME!! !” I’m so happy happy for you that you got to make all the decisions that were right for you… it’s an even greater bonus that you got to have the birth you dreamed of. You’re amazing. I look forward to meeting Aura soon! Such a beautiful, inspiring birth story! Thank you for sharing! I will carry this in my heart as I VBAC in August! Blessings to you and your family! Hope to have such a wonderful story to share in the next few days! Wow! So lovely you wrote out your story- it was beautiful. Thank you and blessings to you and yours & of course to The Amazing Davey! I’m just seeing all these comments now. Thank you everyone! I’m so happy to share my story if it can help even one person avoid a csection!